Normally, every individual is interested in knowing how joining an organization will benefit them personally. Sometimes that benefit is transformed into how the individual might contribute to the organization. Every Detachment and every member should be able to respond to the question of "How does the Marine Corps League benefit me?" 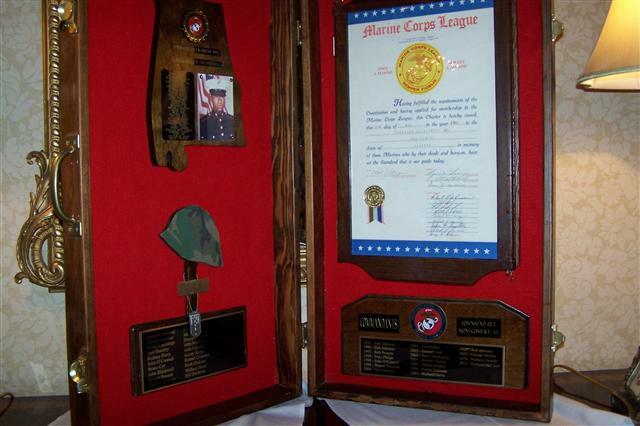 These are some of the benefits provided by the Marine Corps League. A voice in Congressional and Legislative matters (as a result of the Congressional Charter) on a National level. The Department also has a legislative Officer that participates on a Department level. A periodic magazine that provides information on the Marine Corps, the League, Departments, and Detachments. The primary reason Marines join the Marine Corps League is to associate with a Marine organization. There are other Marine associations, but the Marine Corps League offers all Marines and qualified FMF Corpsmen of every era, rank, and unit an opportunity to participate together in an organization of Marines. Developing and supporting programs to cultivate positive youth activities through Young Marines, Youth Physical Fitness Programs, education in schools on patriotism and responsible citizenship, and/or assisting existing youth programs, such as Scouting, JROTC, Boys & Girls clubs, and supporting local, state and National Scholarship Programs. Providing service for, and supporting, the annual Marine Corps Reserve Toys for Tots campaign through collection and distribution of toys. Developing and/or assisting in veterans programs that support veterans in need, such as the VA Volunteer Services program for VA hospitals, veterans stand-down programs, direction and guidance for veterans needing assistance, and support of other veteran programs. Supporting Marines, Marine units, and Marine families. Assistance and support to families during times of deployment, sustaining programs and activities of the Marine Corps and developing programs which help Marines get their job accomplished and interface effectively within the community. Developing programs and events that raise funds for Detachment and Marine Corps League objectives. Developing programs of special interest to Marines such as the annual Marine Corps Birthday celebration, recognition of Naval Corpsmen on their anniversary and honoring Marines on special occasions and events. Supporting and/or developing programs that lend assistance to those in need within the community, such as food drives, hospital assistance and participating in community programs and events. Taking care to support members and Marines and their families in time of distress, need, and illness by personal contact, cards, gifts, and financial assistance (if appropriate and/or realistic). Developing social events on a regular basis that are of interest to members, Marines, and/or their families that develop Detachment cohesiveness and esprit de corps. Acknowledging members, Marines and community citizens for deeds and actions that warrant recognition through awards, certificates, plaques, etc.